The User Advocacy team recently took park in an offsite with the rest of the Engagement organization (Branding, PR, Support, Community, etc. ), and we decided to try an interesting experiment. 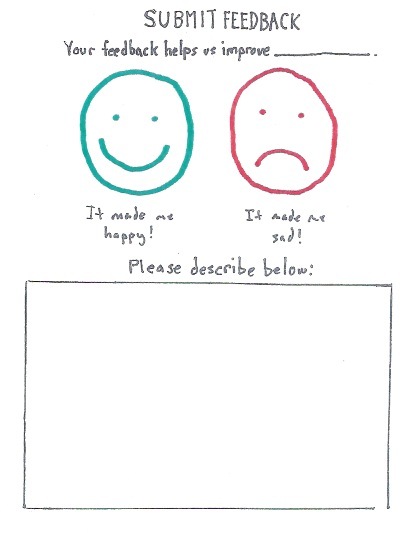 Our amazing developer Will Kahn-Greene made a fun hand-drawn version of our input feedback form. We then decided to have some fun while gaining insight by printing out enough copies to get feedback from all of the conference attendees. We gave everyone open-ended instructions to fill out the feedback form on any of our products so that we could present the results later on that week. Our results were interesting, coming from a group of internal power-users familiar with our latest products. In general the feedback was focused on Firefox Desktop with a good mix of positive comments and comments on areas where we need to improve. Some of the comments even contained interesting product ideas! Given that the majority of this audience likes to be on pre-release channels of our products, we also received a great amount of quality feedback about Australis. It was also good to see that, as a company, we’re able to still look at our products objectively and discuss places where we need to do better! Some of the positive themes that we kept hearing about were Firefox’s great customizability, its fast performance, and that Australis is a big UI/UX improvement. Some areas that we were told needs improvement are sync setup/latency (improved in Firefox 29 with Firefox Accounts), stability especially with 3rd party plug-ins, and providing users a clean and intuitive user experience especially for less technical users. Let us know if you have any suggestions on how to improve this exercise in the future, and feel free to use/adapt our physical input card (we’re all about the open source :p )! It seems that the feedback you received was great! 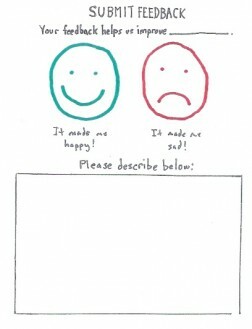 However, this feedback comes inside and not the outside. Things like the NDA must be taken into account as well as how can be said even though Mozilla is being open. This makes me curious on what “open-ended instructions” you provided. Sorry for the late reply! Our instructions were for the attendees to provide feedback on any of our products in any way that they saw fit. Both internally and externally our goal is to maximize feedback volume by not constraining users with rules. This is helpful for two reasons: The first is obviously that more data allows us to derive more statistically significant analyses. The second is that it minimizes barriers to feedback that might bias our dataset to a particular type of user. These reasons are why feedback.mozilla.org is designed to be so simple. Per openess, we just wanted to provide an overview of a fun exercise and didn’t think that the raw data was super releasable. I think the raw external feedback data is more interesting/significant which you can find at input.mozilla.org.